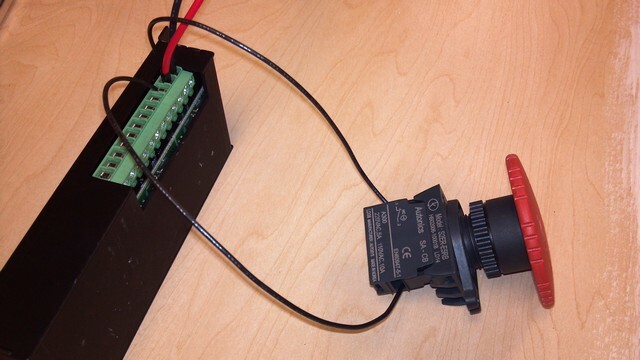 While the G540 makes hooking up motors and getting them working a breeze, it can still be a bit daunting for those new to electronics and CNC. We created this handy step by step guide to help get you going with our products. Read on to see how it's done using our components. 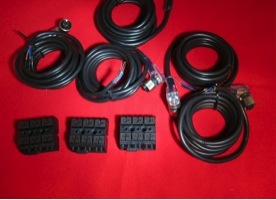 The first step is to insure you have all of the parts needed -- these are shown below. 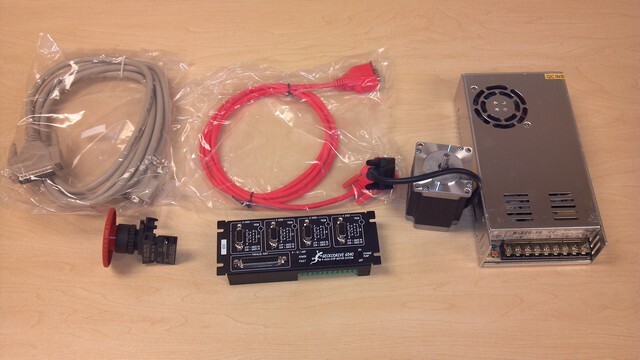 You'll need an AC power cable, a DC power supply, some 18 AWG or larger wire to connect the power supply, a motor, a motor cable, a parallel port cable, and of course a G540. Note, this guide shows a 7.3A power supply for a 3 axis system, but the process is the same for the 4 axis system, you'll just be using the larger 12.5A supply. 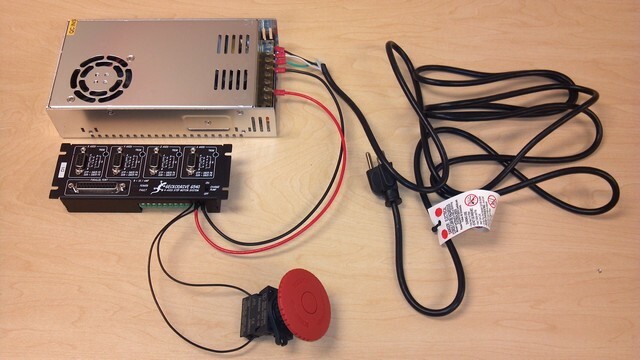 It's also recommended to have an emergency stop, but if you don't have one, you can jumper this out initially while you're testing motors off of your machine. We'll show you how to hook the system up both jumpered and with an e-stop. Next you will want to make sure you have a few tools handy -- a Philips head screwdriver for the power supply, a small Philips for the G540 connections, and a set of wire strippers will be needed. For a professional install, ferrules and crimps can be used on your wire ends, but this isn't strictly necessary. 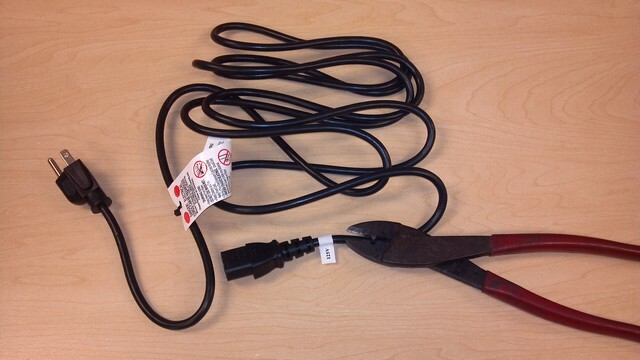 Start by cutting the female end off of an AC power cord. Almost any cord will suffice, as the G540 does not draw excessive amounts of current. Do not plug the cable into the wall. Strip the ends off of the wires, and crimp on ring or spade terminals if desired. 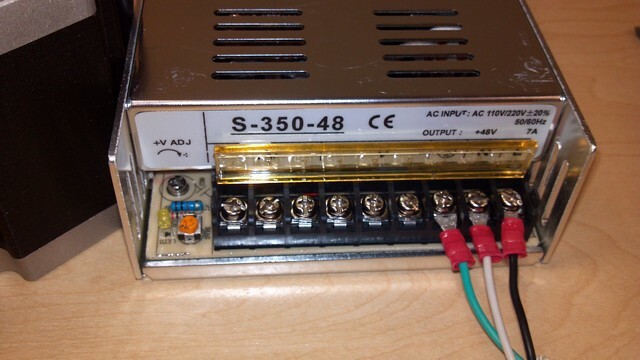 Next, locate the AC input terminals on the power supply. Install the wires per the colors below. Green is ground, black is hot (or "line") and white is neutral. Next up, you'll need to connect DC power to the G540 using your 18 AWG or larger cable. Keep these as short as feasible (less than 12" if possible), as the G540 can be finicky about inductance if they get too long. We suggest red for the 48V+ and black for common (48V-). Crimp on spade and ferrules are shown, but are not required. 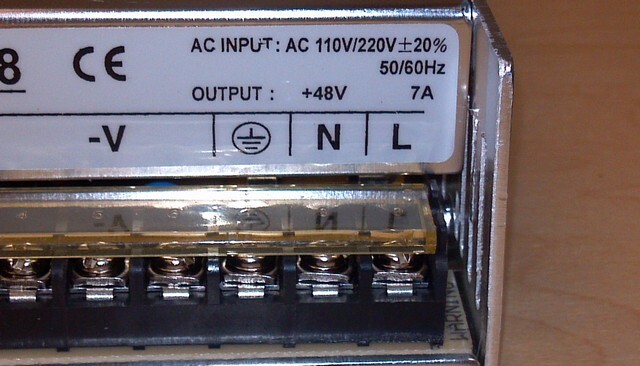 Connect these wires to the V+ and V- terminals on the power supply as shown. 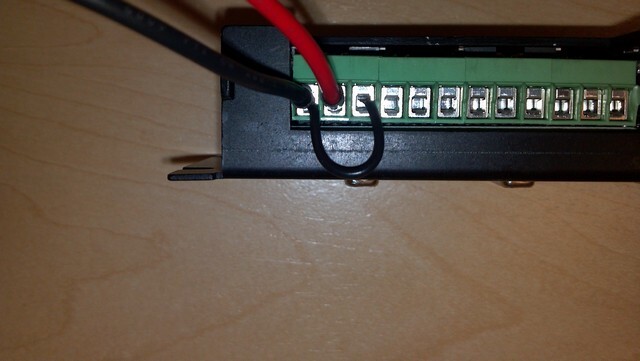 Connect the other end of the wires to the power terminals on the G540, pin 11 for 48V+, and pin 12 for common. All that's left is to plug in the motors and a parallel port cable and you're ready to go! If you're using one of our parallel port cables, you'll be in good shape. 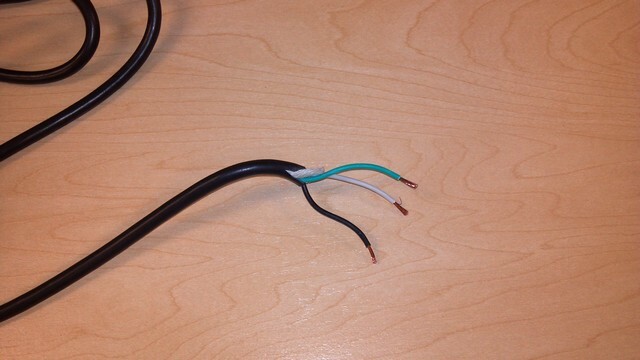 Make sure any DB25 cable you use is fully populated -- many cheap printer cables do not have all of the pins going through, and is often missing conductors that are assigned to step and direction signals on the G540. We hope you found this guide helpful and informative. Now the mandatory disclaimer: Working with electricity can expose you to dangerous or lethal AC currents. While this guide contains helpful information, you are responsible for keeping yourself safe. If you are at all unsure about completing any aspect of your electrical wiring, hire a licensed electrician or qualified electrical contractor to do the work for you. Users of this content agree that use of this guide and all products or content contained herein are at your own risk, and there is no warranty expressly made or implied herein. While it's not necessary to get your machine moving, the G540 does support limit and home switches. 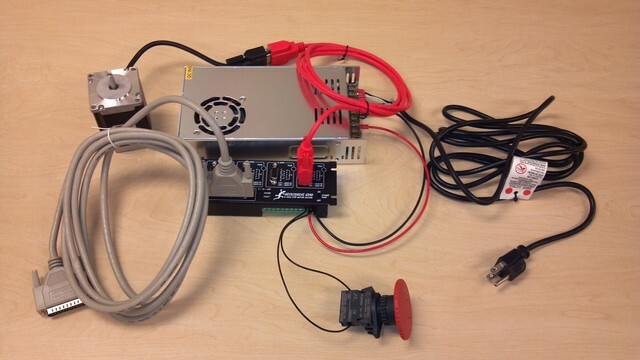 For limit switches, you will need your 5 cables, an AC adapter, and some sort of terminal blocks to connect up to the G540. 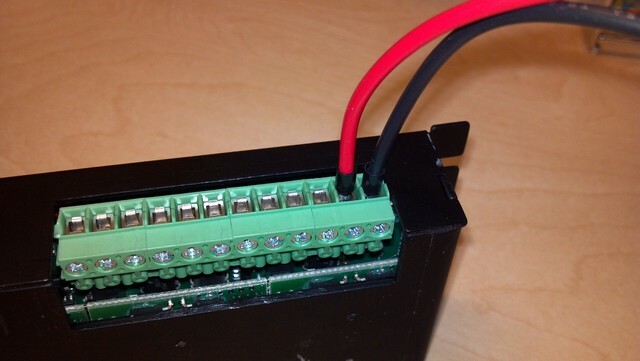 To begin with, you will need to cut the ends off of your 12V AC adapter, and strip the individual wires back. 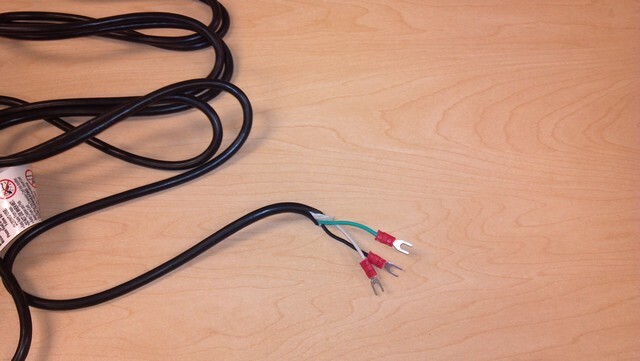 Check with a multimeter to see which wire is V+ and which is common. Typically, 12V is on a red wire, while common is black. 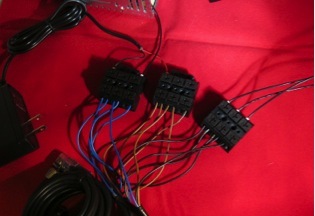 Connect each of these wires to individual terminal blocks, where you will be attaching power and common from the sensor cables. Wire all of the blue wires (12V Common) from the sensors into the same terminal block as the common from your AC adapter (black in this example). Note, for this terminal block, we have jumpered together the 3 sets of terminals so all wires coming into the block are connected. 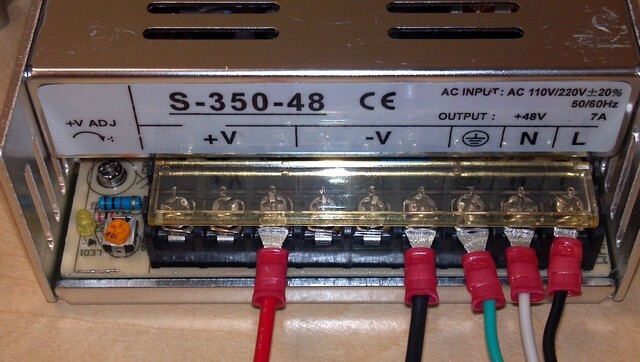 Run an additional wire from this terminal block to the V- on the 48V supply powering the G540 so that these supplies have the same ground reference (shown below coming out of the upper right corner of the terminal block with the blue wires). 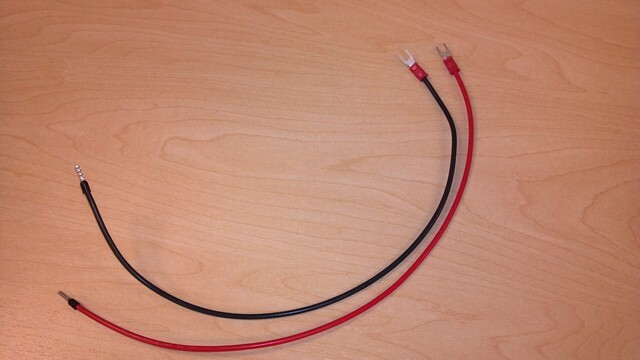 Wire all of the brown wires (12V) from the sensors into the same terminal block as the 12V from your AC adapter (red in this example). Note, for this terminal block, we have jumpered together the 3 sets of terminals so all wires coming into the block are connected. 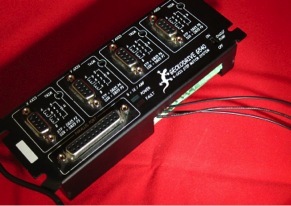 Pair up the black wires (Signal) for the X+/X- and Y+/Y- sensors, while running A separately into the first 3 inputs of G540. In the picture below, these wires are shown going into an intermediate terminal block and then on to the G540, which makes wiring a bit easier. Note also that in this terminal block, we have not jumpered together the 3 terminal sets, so the 3 wires going out to the right are all discrete signals. 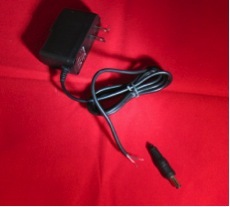 Pin 13, the remaining input pin, can be used for a z touch plate or other application as needed later on.